Well, that’s it almost over. I’ll lose wi-fi connection in about an hour when I check out of the hotel so just time for a final update. I’ll spend my last few hours in Japan wandering around the tourist shops of Namba then it’s off to Kansai airport for the flight to Dubai, then after a brief stop over at Dubai, it’s onwards to Glasgow. It’s difficult to tell from the small camera screen if the photos are sharp, exposed correctly, well composed, etc, but when I get home I’ll copy them over to my computer and have a look. 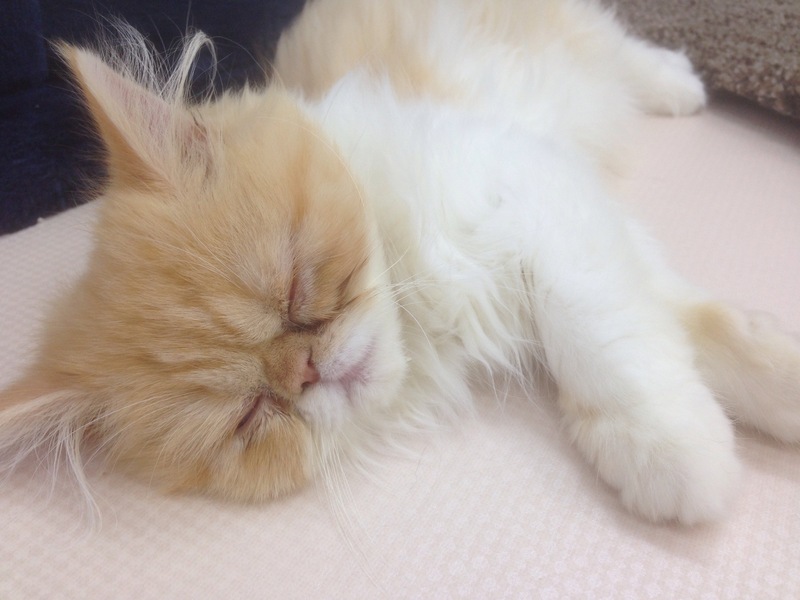 My final blog image is from the Neko-cafe I visited a few days ago; It’s how I’m likely to feel by the time I get home! 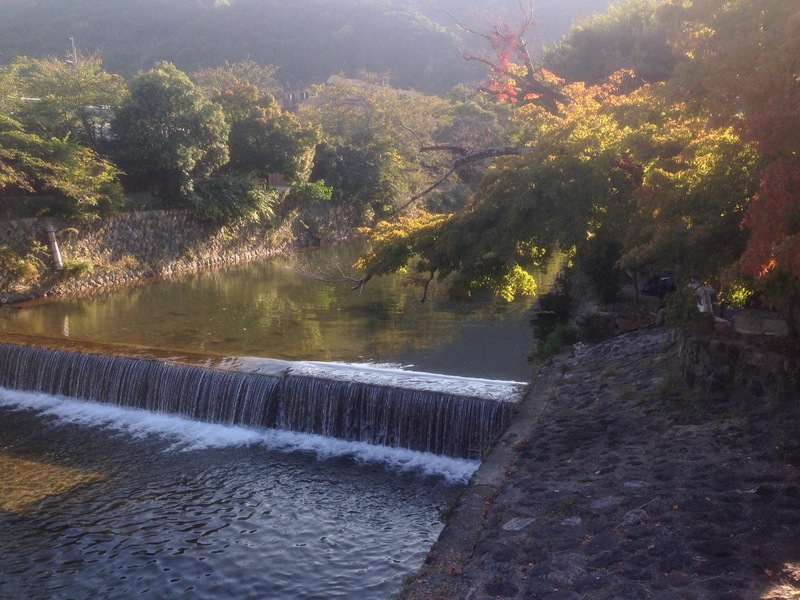 My final full day in Japan was spent back at Arashiyama on the outskirts of Kyoto. After a nice lunch I returned to the bamboo groves then went on to visit Okochi Sanso, a private garden villa constructed by the Japanese silent movie actor Okochi Denjiro over a 30 year period before his death in 1962. The garden is full of cherry trees, maple trees and pine and is a lovely place to spend an hour or two. As well as getting some photos of the monkeys, the view from the park, which is 160m (525ft) above the River Oi below is quite impressive so I grabbed a few shots of the town and Kyoto too! Back at Osaka tonight, I had a last walk around the entertainment and shopping districts of Shinsaibashi and Dontonburi. After the shops I decided to visit Burger King. 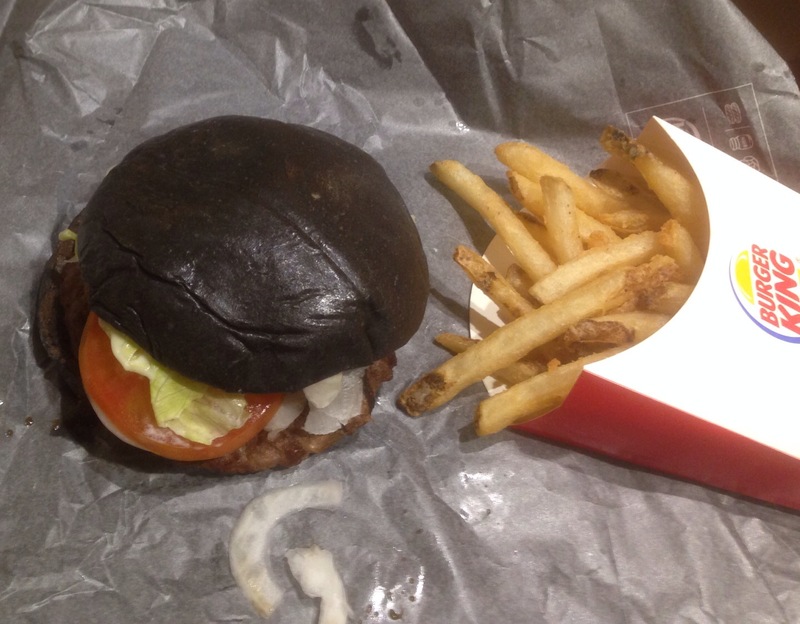 Now, I know that this doesn’t really sound like a particularly Japanese end to the trip but since last Friday, Burger King have been selling the kuro burger at outlets in Japan. Tomorrow I pack up and head off on the long journey home to Scotland. I’m not sure what will be the hardest thing to adapt to when I get home: the temperature change or the absence of squid ink!! Today was spent at Japan’s ancient capital of Nara, which is about an hour away from Osaka by direct train from JR Osaka Namba. Nara is a lot quieter than Kyoto, and everything is within walking distance, so today was a lot more relaxed than yesterday. The visit started with a leisurely stroll from JR Nara station to the Kofukuji Temple, an important Buddhist temple which includes a three story and a five story pagoda. After Kofukuji, it was a 15 minute walk to a traditional Japanese garden (Yoshikien Garden) which is actually three separate gardens (a water garden, moss garden and a flower garden). While at the moss garden I stopped for a while to enjoy a traditional whisked green tea sitting on a mat in the sun on the balcony of a tea house. 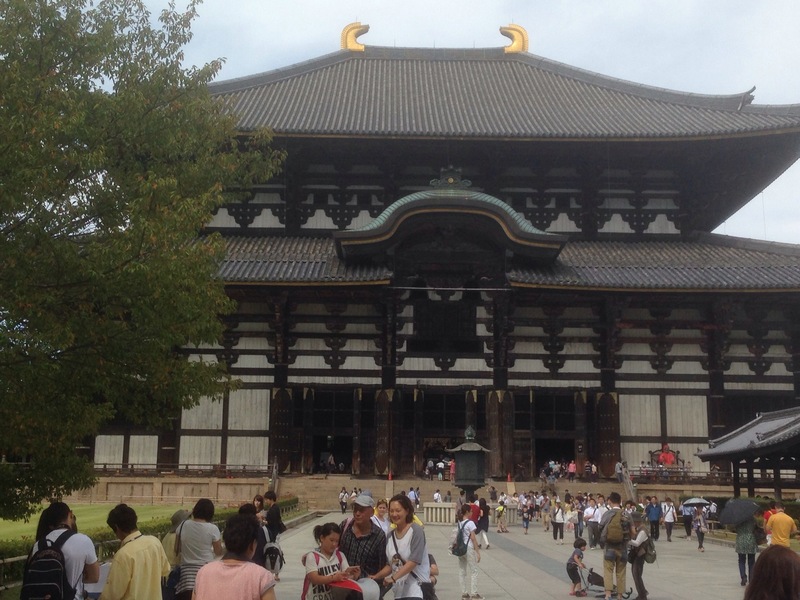 After the gardens I had another brief walk to the famous Todai-ji Buddhist temple, until 1998 the largest wooden structure in the world and home to the worlds largest bronze statue of the Buddha Daibutso, which, even though seated, is 52ft (16m) high! 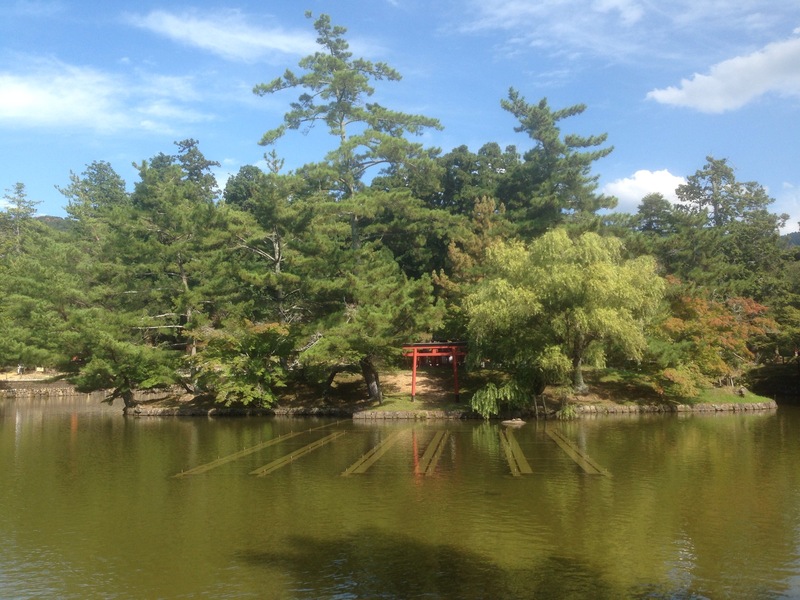 From Todai-ji it was another brief walk past a lovely pond (Kagami-ike pond) teaming with carp and turtles, and with a small island in the centre which had a shrine and torii gate. My final location for today was the Shinto Kasuga Taisha Shrine, which was a brief walk away through some beautiful camphor woods. I managed to take a lot of photos today which I’ll share on my Facebook page and here on my blog when I return home to Scotland later this week. Tomorrow is my last full day in Japan and I’ll be spending it back at Arishiyama, where I’ll be visiting a monkey park, revisiting the bamboo groves and taking a boat trip down the Oi river in the hope of seeing some fishermen using the traditional method of using cormorants to catch their fish! Busy day today in and around Kyoto. I travelled by train from Osaka to Kawaramachi station in Kyoto, then walked to Gion-shijo station for another train to Fushimi-inari. Fushimi-inari is the head shrine of the Shinto kami Inari in Japan. Kami are spirits or natural phenomenon that are worshipped as part of the Shinto religion. Inari are the kami of foxes, and of fertility, rice, tea and sake, agriculture and industry and general worldly success and prosperity. Inari is one of the most popular kami in Japan with around a third of all Shinto shrines dedicated to them. This particular shrine is famous for its thousands of torii gates. 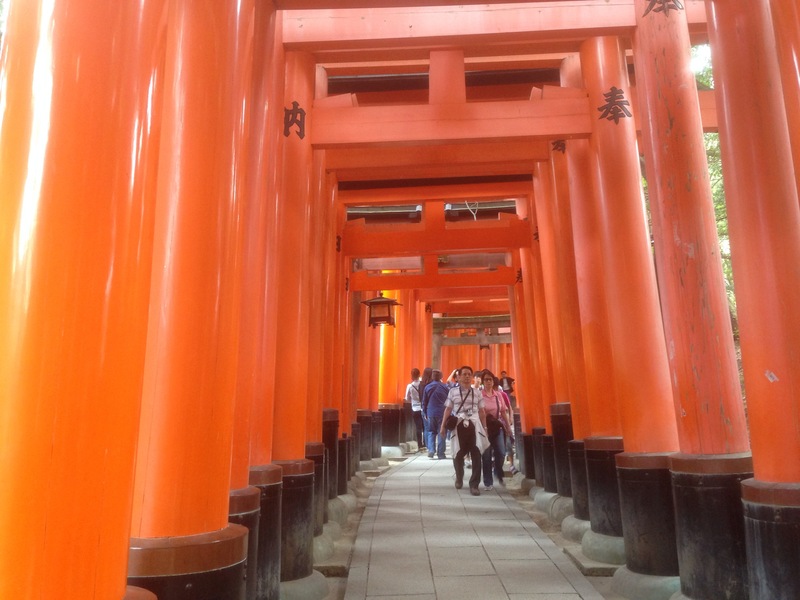 Fans of the film “memoirs of a geisha” will recognise the torii gates as part of the film was shot in the shrine. I spent a few hours here and took lots of photos of the gates and surrounding shrines, so hopefully I’ll be able to share some of these with you when I return home. After the shrine I spent some time in a neko-cafe near the train station. 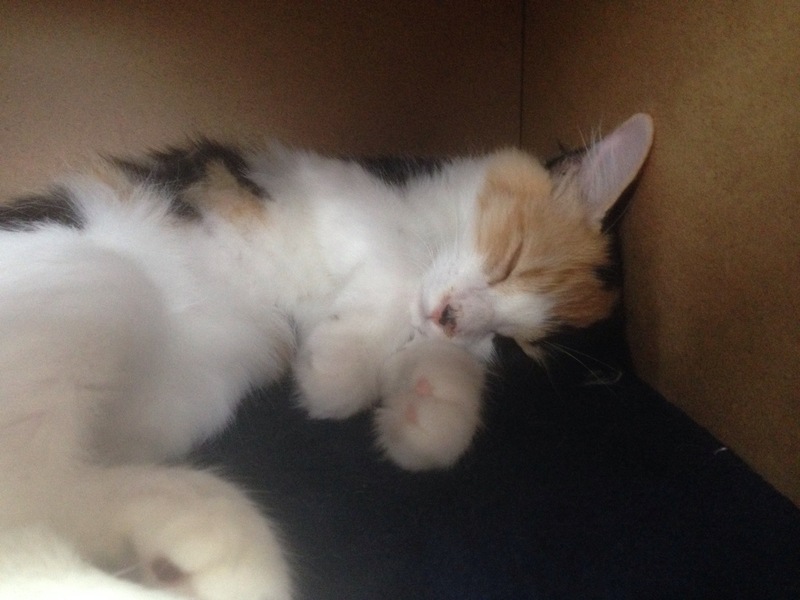 This is basically a cafe where you pay to spend some time with some of the most chilled out cats I’ve ever met! After relaxing with some cats for a while it was back on the train to Gion for sunset so that I could grab some shots of the famous tea-rooms as they woke for the night. 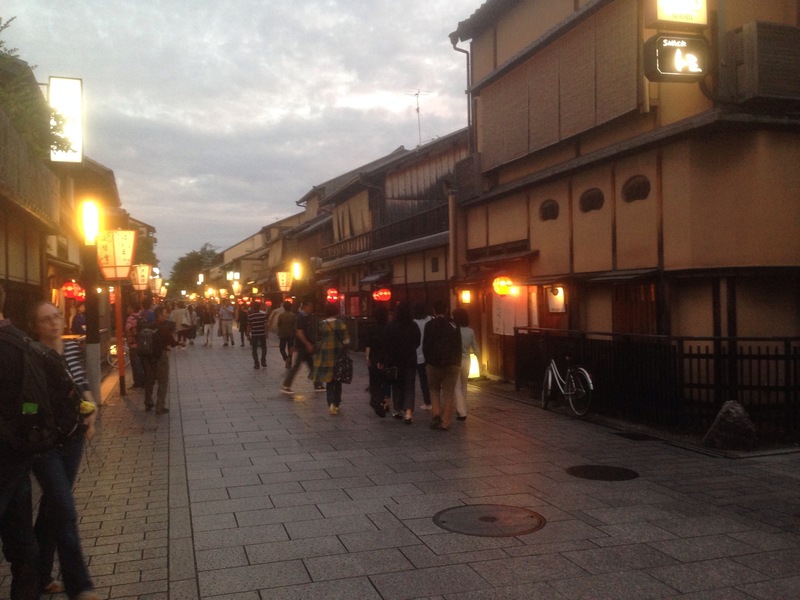 I was also hoping to grab some shots of geisha on their way between their okiya and the tea-houses. Unfortunately I didn’t manage to see any geisha on this trip but I did catch a few locals (men and women) in traditional kimono, so look out for them when I get home! I’m off to Nara tomorrow, ancient capital of Japan, and home to the Todai-ji Buddhist temple, the largest wooden structure in the world. According to legend, the god Takemizazuchi arrived in Nara on a white deer to guard the newly built capital. 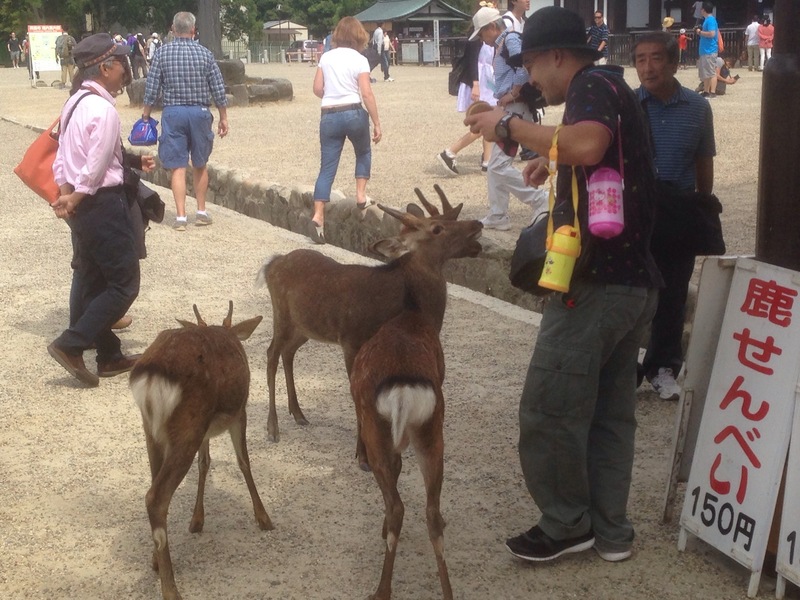 Since then deer have been regarded as heavenly creatures and thousands of wild sika deer roam freely around the town. I’m a bit nervous about this trip as last time I was there a deer BIT my backside…! I travelled to Mount Koya today out towards the Pacific Ocean. A rather long (3hr) series of train journeys / changes finishing with a cable car ride up the mountain side and a bus journey along single track mountain passes saw me safely to the gates of Okunoin, Japan’s largest cemetery and home to many sacred Buddhist temples and shrines. After a lunch of rice and chicken with miso soup and beer at a nearby cafe, it was a leisurely stroll through Okunoin back towards the town centre. The weather wasn’t ideal; dull and overcast, but I managed to grab quite a few photos from Okunoin on my way through which I hope to share with you when I get back to Scotland. After a long walk and some shopping it was back to Osaka. Tonight was spent at the Hard Rock Cafe in Osaka, listening to some live music and having a few beers. Tomorrow I’ll be returning to Kyoto and, in the evening, Gion, where I’ll be hoping to get some photos of the geisha and the traditional tea houses. 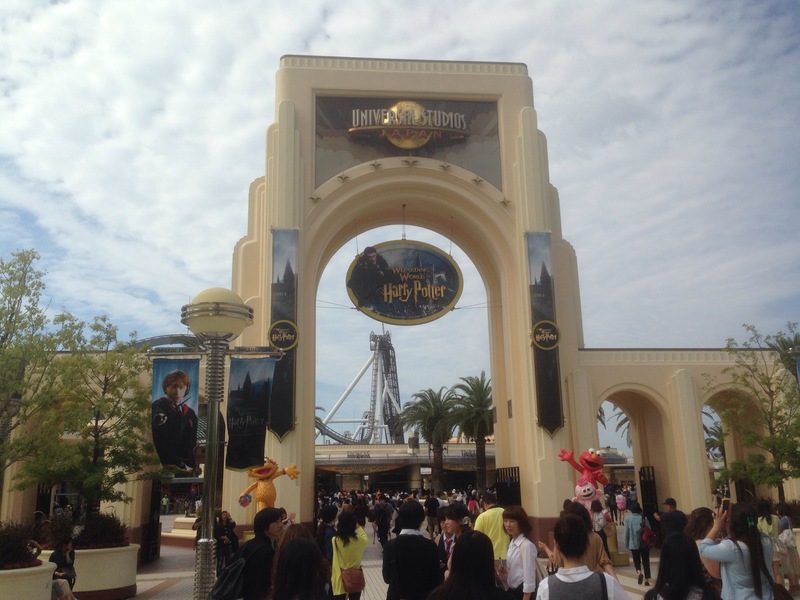 Day off today at Universal Studios Japan. The trip was straight forward: walk to JR Namba then train to Nishikujo and quick change of train then two stops to Universal City station. I’m not really a huge fan of theme parks but if you enjoy overpriced plastic trinkets or standing in line for 1-3hrs at a time in order to take a seat on a 10 minute ride I can recommend it!. Also had a wander around Harry Potter’s Hogwarts. Jurassic park was probably my favourite. 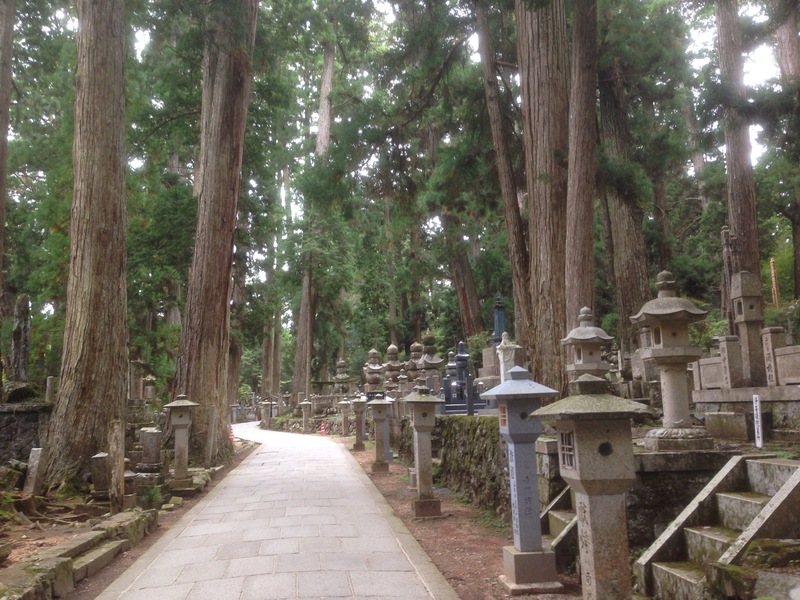 Koyasan is a world heritage site and will celebrate it’s 1200th anniversary in 2015. It’s a huge series of Buddhist shrines and temples high on mount Koya which is around 2hrs from Osaka in the wakayama prefecture out towards the Pacific Ocean. The weather was a little disappointing today as I made my way towards Lake Biwa and the town of Otsu. Still very warm, but grey and overcast and a little windy. The trip was a bit convoluted: subway from Namba to Umeda; train from Umeda to Kawaramachi in Kyoto; a walk to Kyoto JR station then the train to Otsu.